Looking to familiarize yourself with the Animatron Editor? This multi-parted, informative guide will entice your curiosities with the heart of our awesome animation software by providing a thorough and in-depth tour of the Editor Workspace! The Animatron Editor provides you with a clean and simple collection of menus, tools and helpful panels known as the Workspace. The Main Menu is located at the top-left of the Workspace. Clicking on it reveals a list of sub-menus, allowing for more project-related options. The Project Header, visible across the top, shows various information about your current project. This area allows you to edit the project name as well as change the canvas size and background color. Sharing, Privacy and Publishing options are also found here. Your User Account can be easily accessed, revealing your Animatron Project Library. This is the easiest way to switch between multiple projects. The User Profile thumbnail, at the top-right of the Workspace, allows you to see which Animatron Account is currently logged-in. Clicking here allows you to access your Project Library, Explore other public Animatron projects, and Log out of your current User Account. 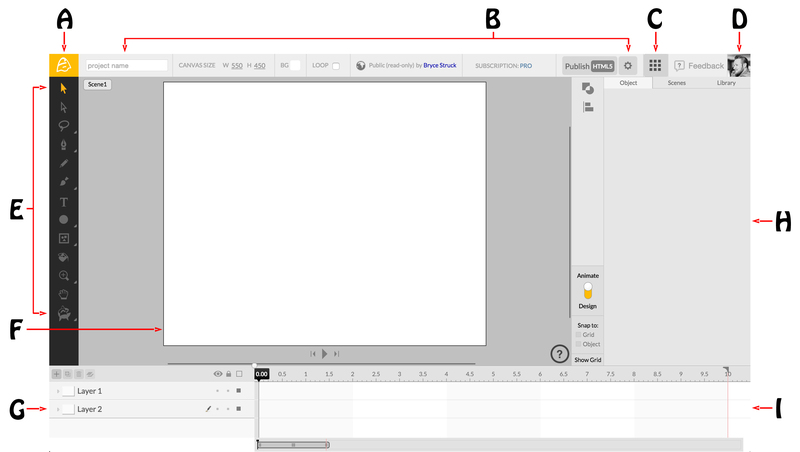 The Toolbar, located vertically along the left edge of the Workspace, contains several design tools to use within the canvas area. Selection, Drawing, Text and Shape tools are found here. The Zoom and Hand tools let you manipulate the visible size and orientation of the canvas. The Canvas, found in the center area of the workspace, allows you to apply shapes and objects that can be drawn or imported to the scene. The Canvas borders act as a frame, revealing all shapes, objects and animations contained within, during playback and publishing. Any objects in the grey area around the canvas will not be rendered when published. The Layer Panel, located at the bottom-left of the workspace, is used to organize both your design and animation layers. Stacking vertically, layers at the top of the stack will appear in front of layers at the bottom of the stack, when displayed on the Canvas. Various layer types, such as Compound Layers, Groups, Masks, Audio and Video, each have their own unique properties and options. The Inspector Panel on the right side of the workspace is used to locate and manipulate the properties of tools and selected objects, and accompanied by a scene list and asset library. Miscellaneous features for editing, such as the Path Finder and Alignment tools can be found alongside the Inspector. Accompanied by helpful grid and snapping toggles directly below, the Mode Toggle allows you to switch between design mode and animation mode on the fly. The Timeline, along the very bottom, reveals your layers, keyframes and time values used throughout an animated sequence. You are also able to manipulate these keyframes and values, depending on the layer type. With so much to discover around the Editor Workspace, it only makes sense to dive into it even deeper by exploring each menu and panel to see what they contain! Continue your intrigue by joining us again for Part 2, where we'll reveal the Main Menu and its many helpful options!